Flying is not what it used to be. In the 60s it was glamorous and stylish. To fly meant you had arrived, you were part of the jet set. Certainly flying was still for the privileged few, but was it that glamorous? In the 1969 film, "Billion Dollar Brain", Harry Palmer (Michael Caine) received a telephone call on an old Bakelite black telephone. A talking computer told him to go to West London Air Terminal and pick up a package from a locker. He took a taxi to West London Air Terminal at Cromwell Road, Kensington. In the locker were a thermos flask and an air ticket to Helsinki. West London Air Terminal, built in 1963, was a modern, efficient looking building. It had a departure lounge and check-in desks, but no aeroplanes ever landed or took off from there. After check-in passengers and their luggage were transported by bus to Heathrow. 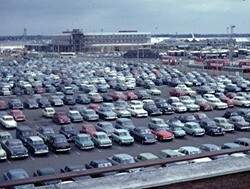 The terminal was used exclusively by British European Airways (BEA). Air travel had an image of glamour and excitement in the 60s. Air travel was for the rich and famous. The 1963 film "The VIPs" tells the story of a group of wealthy people stranded at Heathrow by bad weather. As well as Harry Palmer, the most famous 60s spy, James Bond, travelled by plane to Jamaica (in "Dr No") and Miami (in "Goldfinger"). The phrase "Jet Set" conjures up an image of well-healed and sophisticated international travellers. Today air travel seems far from glamorous. Yet even as far back as the 'fifties flying was opening up to ordinary people as well. The effect of this change was that by the end of the sixties the actual experience of flying was already losing some of its appeal. Subscribers to "Which?" magazine picked up on a few of today's favourite moans: queues, crowding, delays whilst waiting for luggage and damaged luggage. The airlines themselves had been wrestling for years with the problem of transporting increasingly large numbers of people. In the early 'fifties there was only one class of travel: first or better than first class. Such luxuries as cocktail bars, and even beds had been provided on transatlantic flights. Fares were expensive and passengers were either very wealthy or claiming the trip on expenses. By the end of the fifties, there were four classes of travel, deluxe (better than first), first class, tourist class and economy class. Deluxe services gave passengers the very best that the airlines could offer. On the new jets, there were no flat beds or separate bars. Passengers, instead, had wide reclining seats and superb gourmet catering. BOAC's Monarch service was flying from London to New York with Boeing 707s in 1960. The advert stressed the Rolls Royce Conway engines that powered the 707, confirming that BOAC was still buying British. The 707s had just replaced Comets on this route. It also suggested that this was the Rolls Royce of air services. BOAC claimed that it was the finest service in the world. The four class arrangements did not last long. Pan American only offered first and economy on its transatlantic jet service by 707 from 1958. In the sixties economy and tourist were much the same. Most European flights offered passengers a choice of first or economy/tourist. British European Airways offered passengers first and tourist. Tourist class passengers were given a seat with 34" pitch. First class passengers enjoyed 42" pitch and greater seat width, together with better food and drink. In Len Deighton's "The Ipcress File", the Harry Palmer character (he had no name in the book) told readers a free drink and an extra 6" of seat width made first class worth the extra money; if it was on expenses that was! How much more money was it? A flight from London to Helsinki, a trip also made by Harry Palmer, cost 114 first class return and 80 economy by SAS in 1967 (1277 and 896 adjusting for inflation). If you are wondering, the same trip costs 289 economy and 820 business today. There are two interesting points here. Certainly, the trip cost more in the sixties to travel in economy than it does today to travel business class, but business only offers the same legroom as economy did in the sixties. The other important factor is that the price differential is much greater today. If you were able to afford the sixties' economy fare, you might think it was worth paying about forty percent more for greater comfort and better food and a more enjoyable trip. Nowadays it would be hard to justify paying nearly three times as much for the business class fare. Travelling economy in the sixties could vary from airline to airline, just as it does today. In 1965 a journalist writing for 'The Aeroplane' made a round the world trip in economy class. He found that six-abreast seats with 34" pitch did not offer enough comfort to sleep. Some airlines even allowed more than the regulation 34" and some even served champagne to economy passengers. Free food for tourist and economy passengers had become common in the sixties. The seats in BOAC's VC10s had a reputation for being particularly comfortable so much so, that this writer felt that they solved the legroom problem. He also found that economy passengers were often infrequent flyers, and that they did not mix well with more seasoned travellers. One innovation from the sixties that made flying more bearable in the less comfortable parts of the plane was in-flight movies, or IFE (in-flight entertainment). There had been experimentation with in-flight movies as early as 1925. However, TWA was the first airline to regularly show in-flight movies. Their first offering was 'By Love Possessed', shown in 1961. Passenger experience of in-flight movies in the 60s was vastly different from today. They were only shown on popular long-haul routes. Not all airlines did them, although there was increasing competitive pressure to do so. There could only be one movie per cabin. It was either a video, or a 16mm cine film. United offered a 16mm colour cine system and the choice of several audio channels as an alternative. Films shown by airlines were necessarily bland. They had to offend no-one and attempt to entertain as many passengers as possible. By 1966 there were over 200 daily feature length movies being shown by the airline industry. They were usually somewhat behind what was on offer in the cinemas. Nevertheless, passengers showed a distinct liking for them. At the end of the 60s there were two radical developments that promised to shape the future of air travel: jumbo jets and super sonic travel. Concorde demonstrated supersonic travel in 1969 and the airlines were primed to take up Boeing's new 747 jumbo jet. At the time it seemed that supersonic travel would soon be a part of our lives, but it was the jumbo that really set the pace for the future. The first airline to fly the Boeing 747 was Pan Am. Their first commercial flight was in January 1970. So was air travel in the 60s more glamorous? If you were flying first class, possibly yes. Paradoxically first class was more affordable in the 60s than today. Against that you had to make do with a mere 42" pitch, bettered in most business class seats on long haul flights today. There were fewer people flying in the 60s, so there was probably a greater chance of being next to an empty seat in economy than today. Some economy seats were better than others and most offered the regulation 34" pitch, putting most of today's carriers to shame. But with limited in-flight entertainment and no free drinks, it was hardly that much better than economy travel today. It was more a question of attitude. Flying itself was exciting. It isn't today.